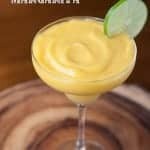 This non-alcoholic kid friendly Virgin Mango Lime Margarita takes only minutes to make and is full of tangy sweet fruit that blends up perfectly smooth. Combine all ingredients in blender and blend until smooth. If your mango is very frozen, you may need to add even more water to make it thin enough to drink, but I prefer this version and to let it melt as we drink it. Garnish with lime and enjoy. To make the adult version, just pour in some tequila and stir or blend.